Sorry we haven't updated sooner, but that happens sometimes, y'know? A quick update to let you all know that our November meeting has been pushed back a week. Instead of meeting this Thursday, we're shifting things to next Thursday which is November 8th. 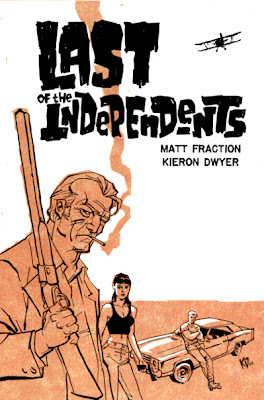 We'll be discussing Matt Fraction's and Kieron Dwyer's modern day western, Last of the Independents by AIT/PlanetLar... and if you're not sure what that is, do a quick Google search and all questions will be answered. And just to change things up even more, we'll be starting out at the store (just like old times) at 7:30PM and then moving to a eating spot once the meetings over... maybe the Villa, maybe not. Oh, and did I mention we've got Matt Fraction as a call-in guest? Yeah, you won't wanna miss this one.